If you’re not using exit slips, you really should try them. Basically, you give students a quick prompt at the end of class (or for elementary, at the end of the day or the end of a subject). Then the students have just a couple minutes to write an answer and turn it in. Writing increases students’ participation. When you ask a question in class, one or two students answer out loud and maybe a few more have their hands raised. The rest of the class may be listening for the answer or they may be daydreaming – it’s sometimes hard to tell. When you instead ask all the students to write an answer to a question, everyone is forced to participate, and you can easily see whether or not each student is understanding. Writing helps students think deeply. When I ask my students to write out how they found an answer or summarize what today’s lesson was about, it forces them to think at a deeper level than just writing an answer. This clarifies their own understanding or reveals areas of misconception. Writing helps you know your students better. Students are surprisingly transparent in their writing, and when you read their thoughts, you start to get to know them better. You are also more in tune with how your students are learning and in what areas they need help. Writing increases students’ communication skills. This one is the obvious result, but the advantage should by no means be overlooked. In today’s society, it doesn’t do much good to have knowledge if you’re not able to communicate it. And with an increase in social media, blogs, and online articles, students need to learn to express their thoughts clearly and concisely. You don’t have to grade formal writing for this to happen. Consistently asking students to answer short, ungraded questions will help increase this valuable skill without adding extra pressure to you or them. So now that I’ve hopefully convinced you to try out exit slips, let me give you a few ideas of what you can ask. Of course there are way more options than this, but these should get you started in the right direction. Pretend your friend was absent from class today and s/he asks you to explain the lesson. What would you tell him/her? Write down one question you have about today’s lesson. Write down one thing I can do to help you. What concept has been most difficult/confusing this chapter? What do you need to do to prepare for the upcoming test? What would you like me to review tomorrow? How did today’s quiz go? What can you do to improve next time? If you were writing a quiz over today’s material, what are 2 questions that you would put on it? 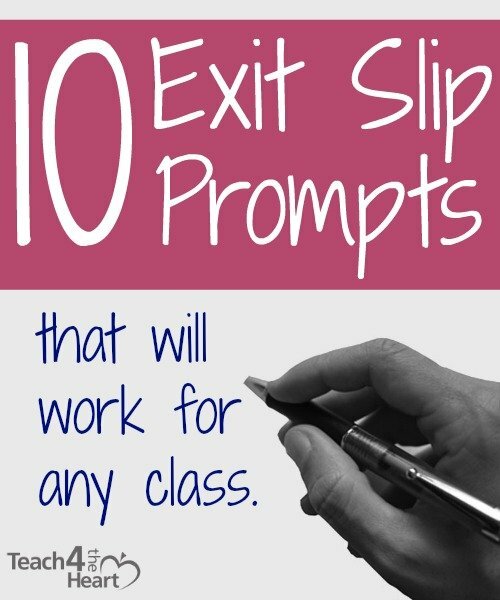 Do you use exit slips in your class? What are your favorite prompts? Links may be monetized. I only recommend resources I believe will be helpful. Not sure where I read this, but often use this prompt as an exit slip: Three things you learned, two questions you still have , and one A-HA moment. I found these tips to be very helpful. Thank you for sharing. Thanks. I loved this idea. Good ideas to increase student participation and communication skills. Your ideas are great! But even greater is your witness for our Savior! God Bless YOu! Exit slips are fabulous feedback tools. Keep in mind that they are most effective when the information gathered from the slips informs the instruction that occurs the next day. Students are brilliant at detecting “busy work.” If exit slips are assigned, but never read or acted upon, they become useless busy work, and they deteriorate the teacher-student relationship as less than trust-worthy. What is best – to let a student answer any one of these exit prompts that they pick from the list or to give one prompt? I’d recommend giving them one prompt at a time – pick the prompt based on what makes the most sense based on what you are doing that day. I like “What surprised you”, “What from today’s class changed, challenged, or confirmed what you thought you knew?” These were borrowed from Kyleen Beers (I hope I am giving the correct attribution) with regards to questions you can ask about any text to elicit class discussion. I also like exit slip questions like: What did you learn today? What did yo contribute to your group today? What are your next steps? If you could change one thing about today’s lesson, what would it be and why? Because I use EQs I might ask — how did today’s class help you answer the EQ? or I might even say Answer the EQ using information from today’s class. The other thing I do is turn the AIM into a question. Thank you for sharing! Great ideas.